Don’t Sell That Old G5 Just Yet! With so many software programs and hardware only supported by the Intel based Mac computers, you might find that having that old Dual/Quad G5 around is becoming more and more problematic. And that may be true, especially as a production machine. More and more of the Apple and Adobe apps only support the newer processor, so upgrading starts to become difficult. 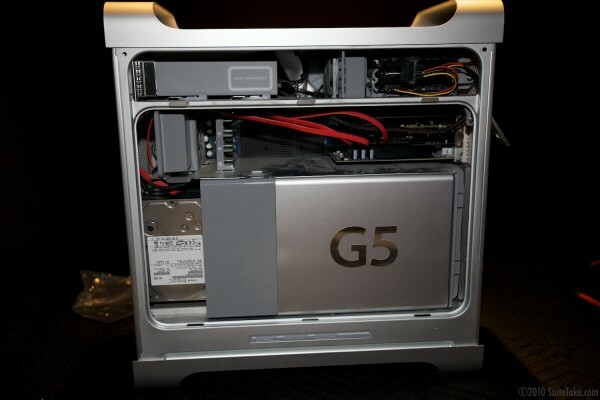 Even Snow Leopard is only supported by Intel machines, so your G5 kind of gets stuck in time. But I’m going to give you a few options to still make use of that older machine, and it will end up having more value to you than the few bucks you can fetch by selling it on eBay. Currently a Quad G5 (the last and fastest G5 made) is going for about $600, and that’s if you throw in a bunch of extra software/upgrades. And who wants to deal with shipping the beast anyway. My vote would be to keep the machine around and put it to work. One of the best things you can do is add more storage to the machine and have it as a file server. For example, in our office we have 3 main edit rooms, but there are many files that we use on jobs that are shared. We have a music library, stock footage, stock effects, some Editor Toolkit graphics, SFX, Custom Compressor Settings and many template items that we’ve created in house. We used to have all of these items installed on every computer in the office. Not a big deal, except when you make an update you have to make sure that every machine is updated with the same items or you quickly get out of sync. Having just one place to store it all is much more manageable. 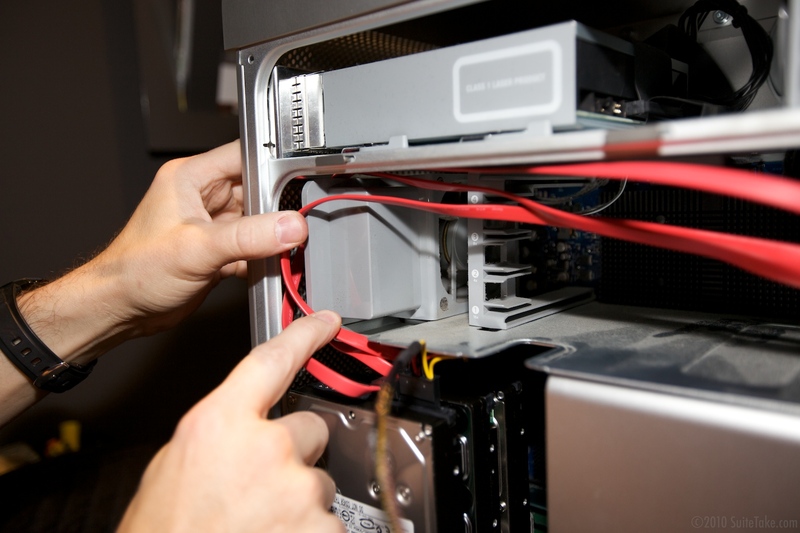 Another option would be to add extra storage and make it a backup server that monitors the computers in your office and backups new files on a daily or weekly basis. 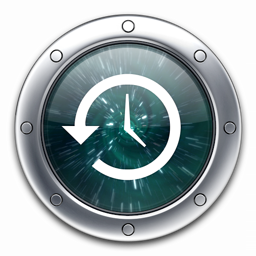 You can do this using the new Retrospect 8 for the mac, or ChronoSync and Chrono Agent. Both packages work the same way, having a small client app running on your workstation, and the server software running on the backup machine. You select what you want to backup, when you want to back it up and where to. The nice part is that once it’s setup properly, you don’t have to keep remembering to back things up before you leave every night. 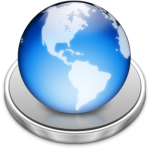 Finally, you can install OSX Server (10.5) software and use it for workgroup management, contact files, file server and even a WIKI. 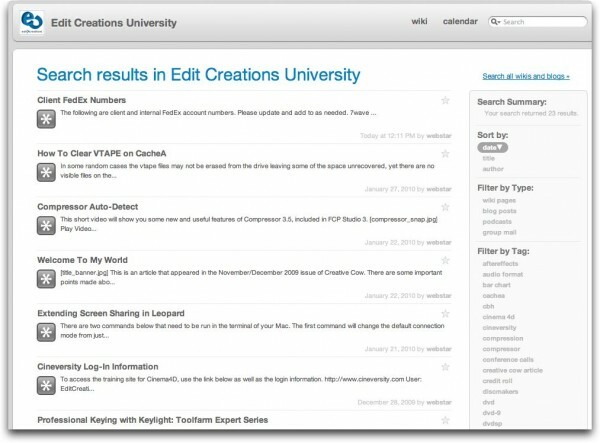 We have a WIKI that we use for ECU (Edit Creations University) where we have all training materials, tips and tricks, job specific information, client FedEx numbers and even the employee manual. It’s all accessible to all employees whenever they need to reference anything, and any employee that has permission can add their own posts or revise posts that are there with new information. 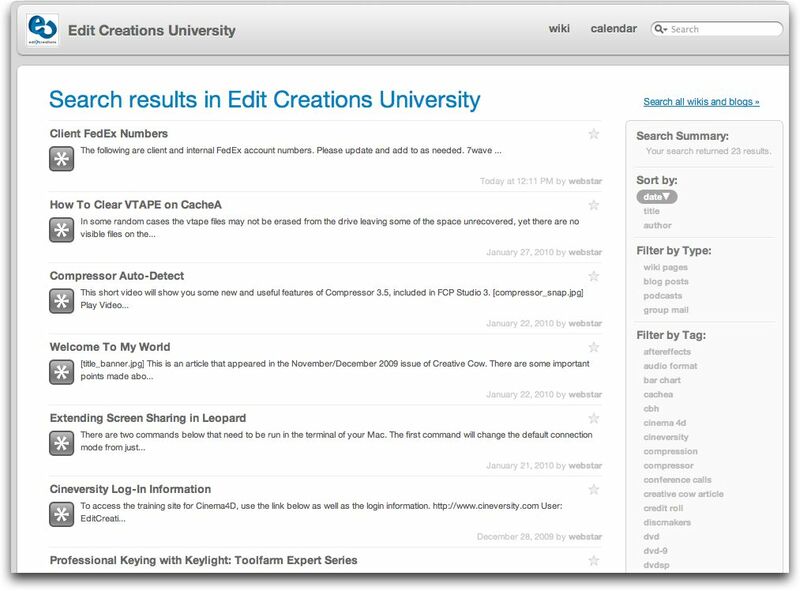 It becomes a very centralized location to store information, files, and video tutorials. Over the past 10 years I have slowly collected still images, QuickTime movies, DVD’s, tv commercials, show opens, movie trailers and so on, of things that I found inspirational or creative. The main reason was that I wanted to have something to spark my creative juices when I was just dead in the water looking for a new idea. I don’t like to steal an idea directly, but there’s plenty you can take from any given example and than make it your own. Often just seeing something will spark an idea of your own. I have so many samples now that I created a database called Creative Spark. 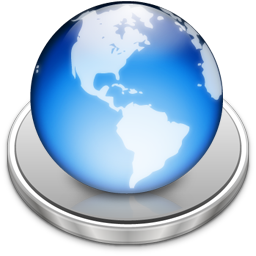 Everything is processed into a friendly format and imported into the database. Once in there, it’s tagged for any number of attributes, from the type of video it is to what types of things is shows examples of (camera work, effects, text, graphics, etc.). This is the kind of thing that works great in a shared environment and it’s now accessible to any of the editors or producers in the office. It also comes in handy when you’re trying to describe an effect or look to a client. It’s much more effective if you actually have the example right there to play for them. Most people hook up an external drive for use with Apple’s TimeMachine. But by adding up to 6TB of internal space, you can do the same thing and take up no extra counter space. We have a TimeMachine volume on each edit computer that runs twice daily* to backup the active projects (and only the active projects). We’ve found this to be a very solid part of our overall backup strategy. * If you use TimeMachine you know that you really don’t have a lot of choice when it runs and how often. However, you can use a free program called TimeMachineEditor to give you more control over this. I personally don’t need it to backup every second that I’m working, but even once a day is enough in most cases. It takes less of a toll on your system resources that way too. 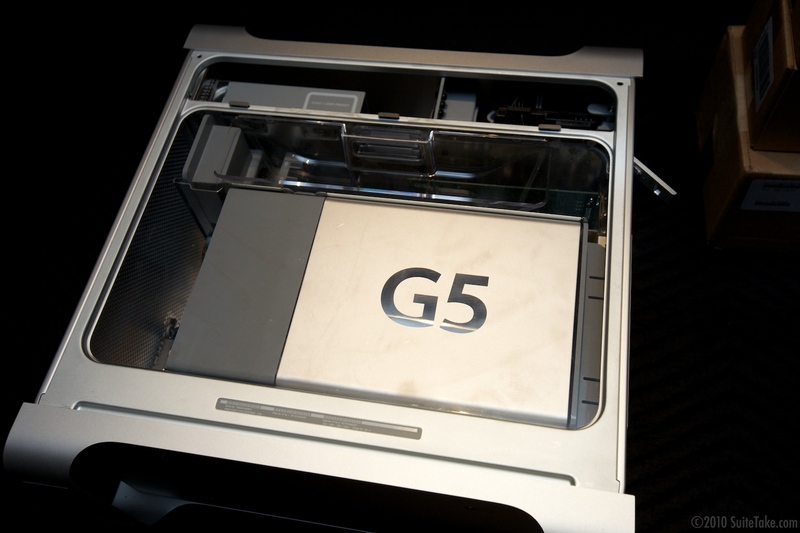 Whatever you decide to do with that G5, more storage is probably going to help. 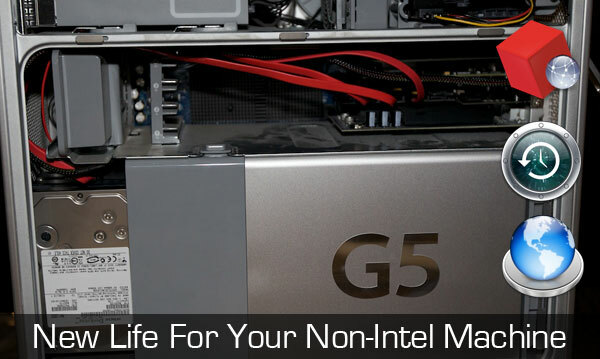 Today’s post will walk you through how to install more storage than you ever imagined in your aging G5 so that it’s up to snuff for you’re data needs. Of the ideas I outlined above, all could be implemented on a single machine and play nicely, and in that case you would absolutely want to add more storage. 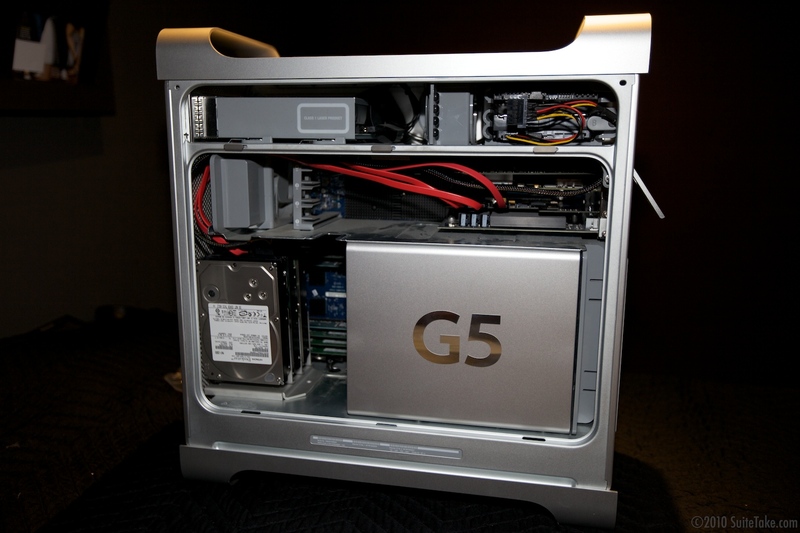 A G5 Tower of any vintage (the photos here are from a Quad G5). Start by laying all of your parts out and making sure you have everything. I say this not only because it’s a good idea, but because I didn’t do this the first time and didn’t realize I was missing the SATA card until the machine was already stripped down. I was pretty bummed. TAKE 2! Side note… there is a video on the Swift DATA product page that claims to show you how to install the drive, but parts of the video are very inaccurate and can be confusing. I was able to verify this by calling them on the phone when they said “Oh yea, that’s wrong… don’t watch that” – which is what gave me the idea for this post). Lay the mac on it’s side and take the side door off of your mac and remove the side cover and clear plastic internal cover. Next, remove the fan assembly toward the front of the machine. It should just pull straight up. Once the fan is out you will see a small metal screw in the near center of the bottom plate. 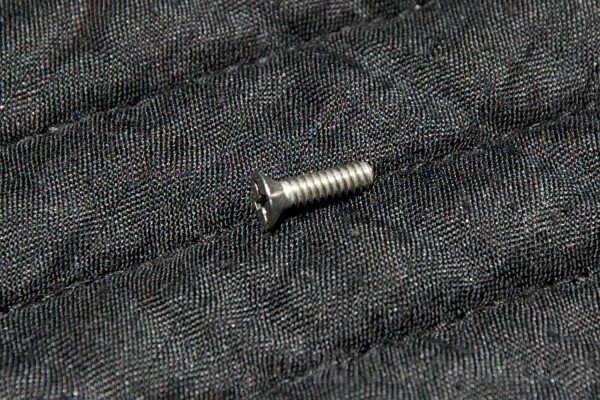 This screw needs to be removed. Don’t worry, it’s not really holding anything in that you need to worry about. Set the screw aside for now. Next, it’s time to attach the brackets to your hard drives. In our case we went with 1TB Green Drives from Western Digital, but you can use larger 1.5 or 2TB drives if you wish. 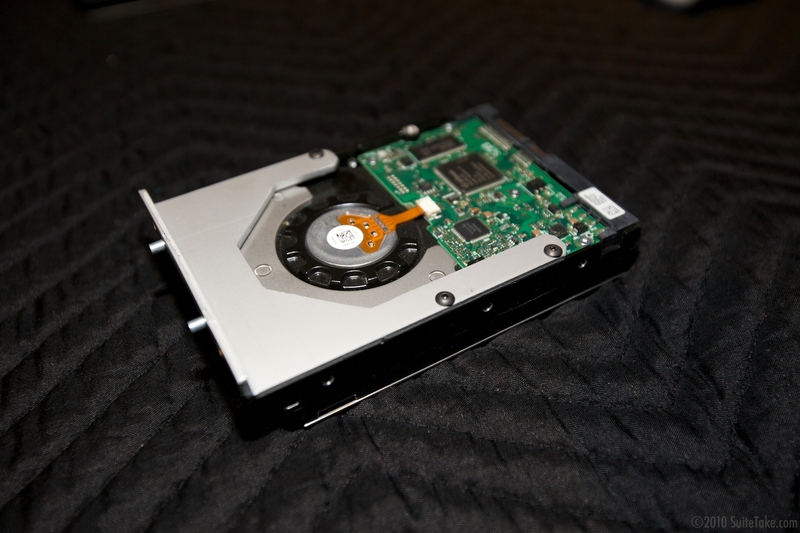 The green drives are preferred for their lower power use, and it should be noted that Seagate drives are not supported, and I’ve personally had issues with Hitachi drives. To be safe, stick with WD greens. In my case I couldn’t get the computer to boot because the Hitachi drives were drawing too much power. With the WD drives this was not a issue. Pay attention to how you connect the bracket. Your instinct may be to put the bracket on so that the bottom lip curls under the drive. However, the drive needs to curl away from the drive. 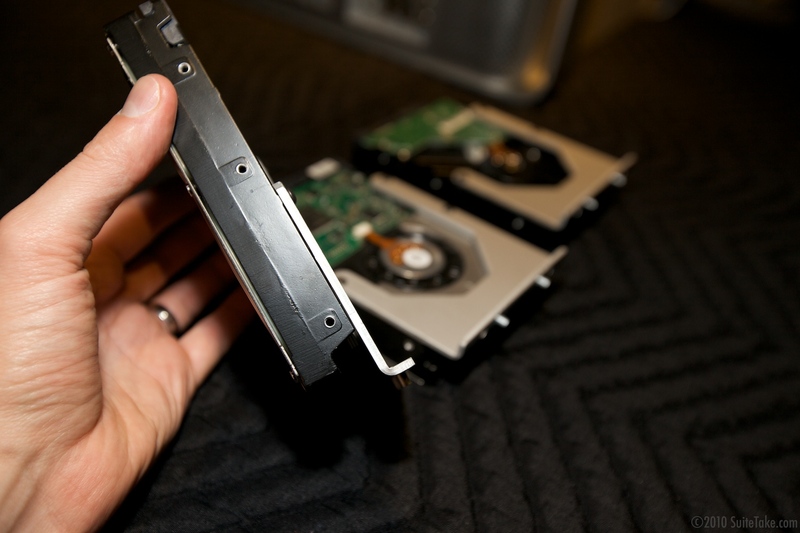 Repeat these steps until all 3 drives are brackets securely attached. With all 3 drives mounted to brackets, it’s time to attach each of the drives to the base mount. 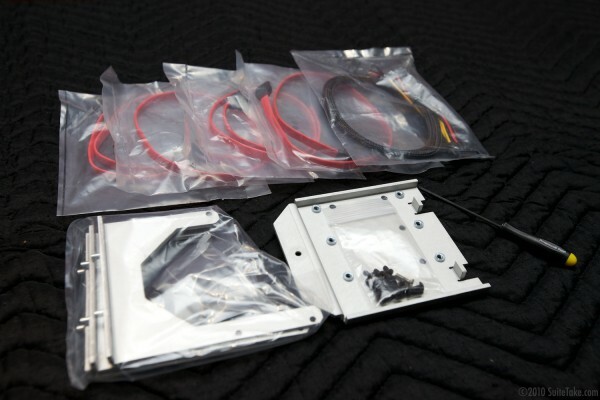 As shown in the photos, attach each drive to the base using the supplied screws from the kit. It’s important that the drives are oriented as shown. 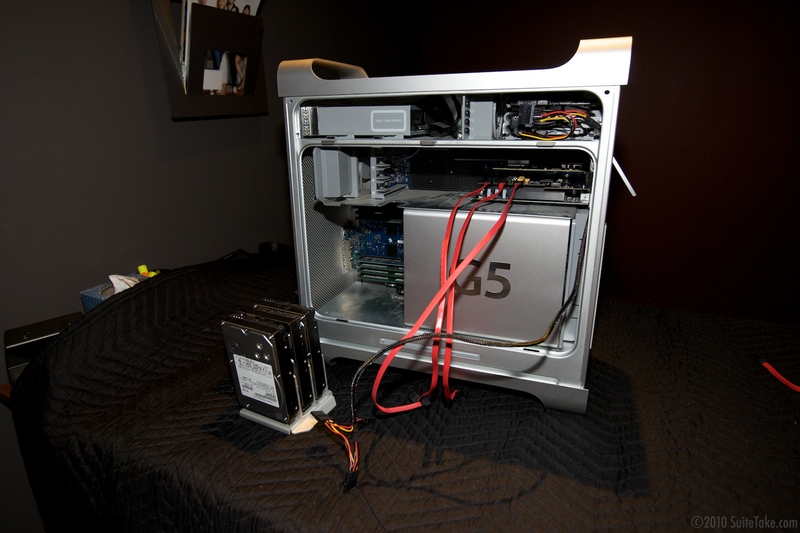 It seems like an odd way to mount the drives, but it’s actually very solid and the parts are well machined. Next it’s time to insert the SATA card. 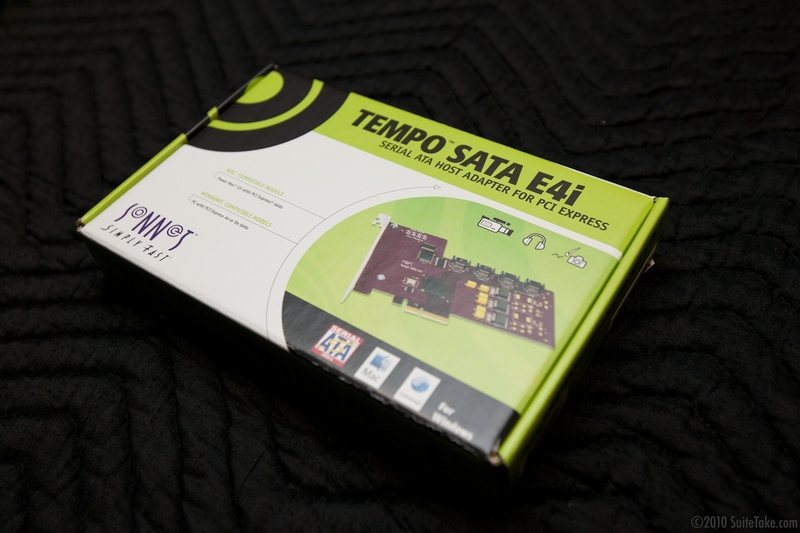 We chose the Tempo Sata E4i which is recommend for our G5 model. Take the card out of the packaging and attach the bight red cables to each of the ports. 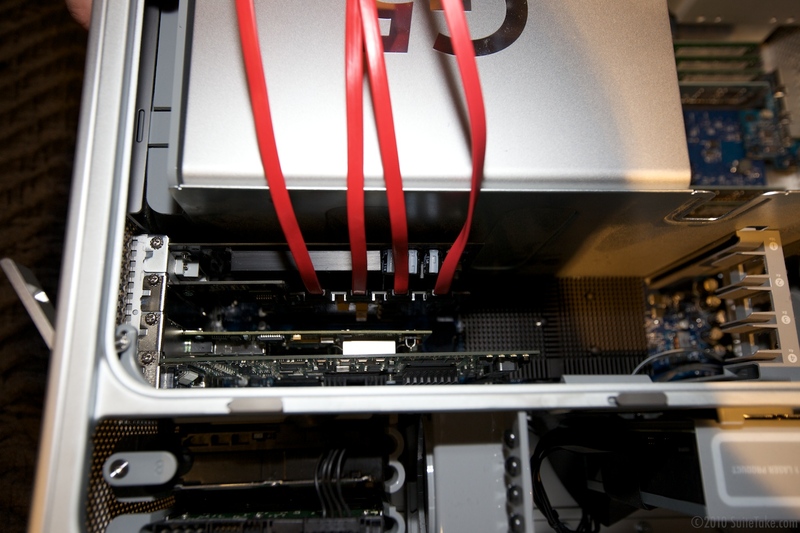 Be sure to plug the FLAT ends of the cables into the card, not the L shaped ones. With all of the cables attached, gently insert the card into your open slot and secure it with a screw into the back of the machine. Just leave the cables hanging out of the side of the box for now. Next you need to hook up the power cable harness. At one in there is a Y type adaptor. What you need to do is pull the power from one of the current machine drives, and plug that power into one end of the Y adaptor. 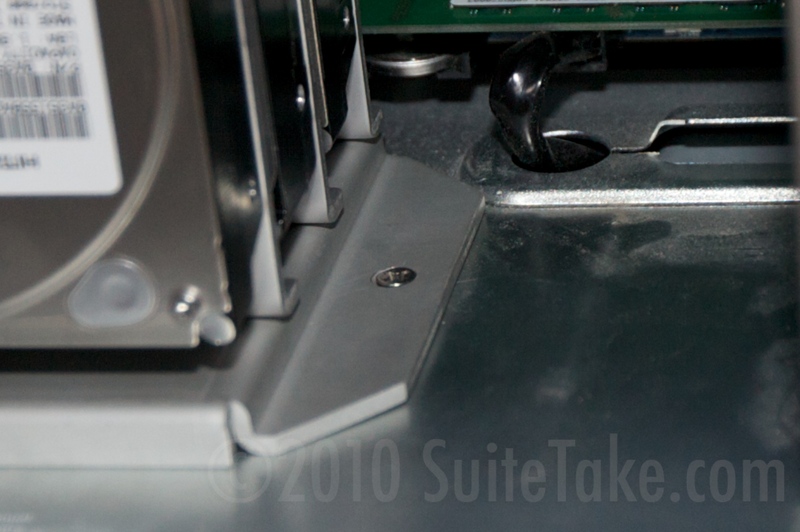 The other end of the Y adaptor goes back into that drive and you route the cable down the back of the machine. It’s basically a way to split off the power supply and share it with the drives you’re adding. Again, leave the power cable hanging out the side of the box, but only after routing it down below the top shelf of the machine. Now the fun part. It’s time to slide the drive assembly in. 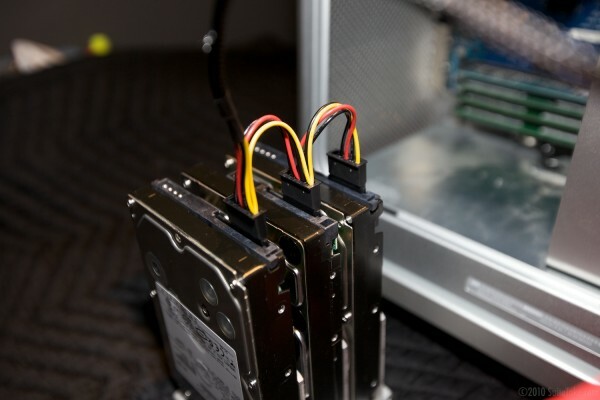 With the drive assembly right next to the computer, work from back to front hooking up both the power and SATA connections. 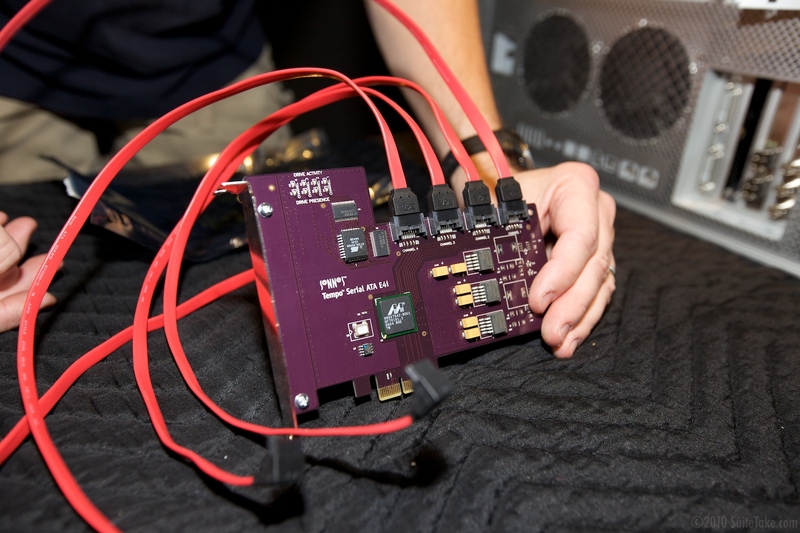 Don’t worry about the cables being a mess, we’ll fix that later. With everything hooked up, slowly and carefully slide the drives into the machine as shown, with the lip/screw hole part of the base facing the back of the machine. Once you get the drives part way in, start to route the cables up and above the fan assembly and above where the cards go. Once you have the drives in the machine, push the assembly toward the front and line up the plate so that the screw holes are aligned. 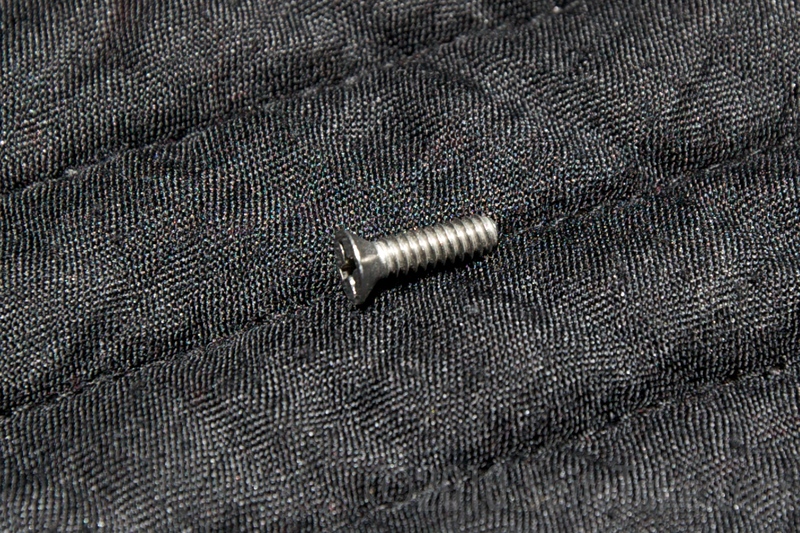 Once aligned, use the longer screw that came with your kit and secure the plate to the base of the machine. 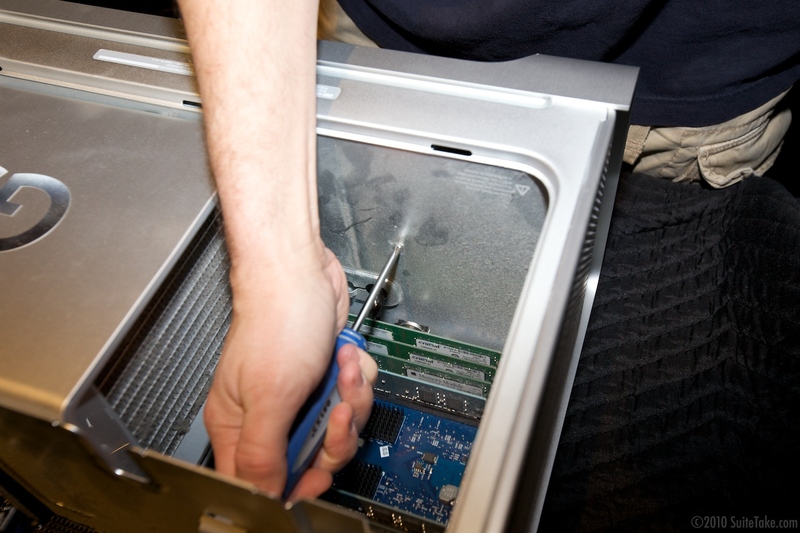 Reinset the fan assembly, close up the case and you’re good to go! It’s snug, but it’s a perfect fit. With a little luck, if you did everything correctly and used the recommended drives the machine will power up. Let the machine boot and use Disk Utilites to format the new drives however you would like. They can be added as 3 separate drives if you prefer, or you can raid them together. We created a raid 0 strip of the 3 to add a single 3TB volume. 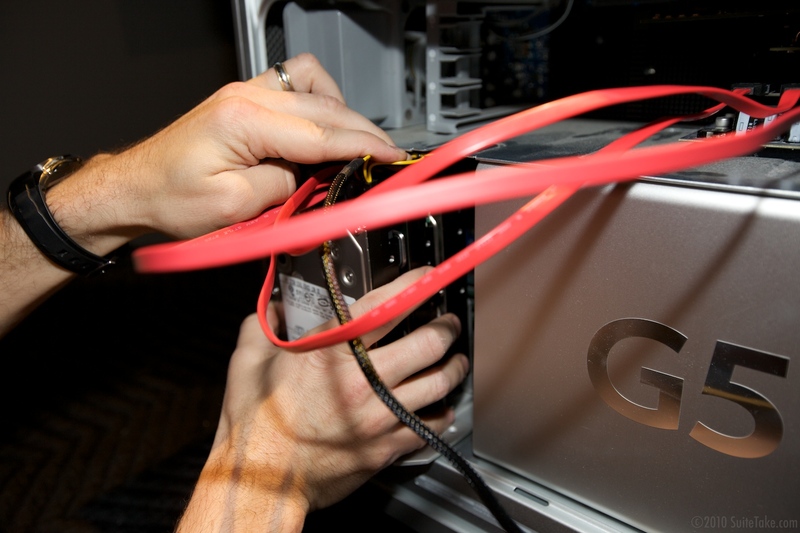 If the machine turns on and off right away, chances are the power supply is overloaded. Make sure you used the correct drives. In some cases, you can try a few times in a row and it will finally start, but then you’re living on the edge a bit. Try to disconnect the power from one of the drives and see if it will start up then. If so, you may need to stick with only a 2-drive upgrade. Why Is There An Airplane In My Room?! Now that you’ve done all of this, there is one little down side that we noticed. Aside from it obviously sucking more power to drive all of the new storage, the fans in the machine run a LOT more. If you have this computer in a back room as a server this might not matter, but if it’s your main edit machine it might start to annoy you. We did this upgrade on 2 machines, one is a server in the back room with a bunch of other equipment, and one was to a Quad G5 that we still edit on (the upgrade shown in this example), so that we could do local TimeMachine backups once daily. The edit machine fans are audibly running a lot more and a lot louder than before. This is no real surprise when you think about all of the extra heat that’s being generated, but you should be aware of it. Otherwise, it’s a very sold upgrade. 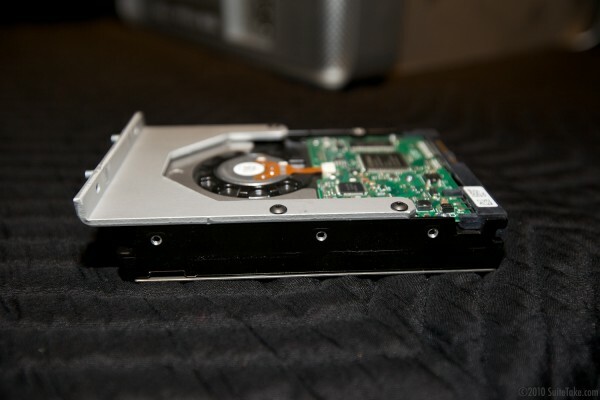 We didn’t do any official benchmarks on the drives but the speed is much faster than any single internal drive, and more than adequate for a TimeMachine volume, file server or even video capture for all but the most high end formats. 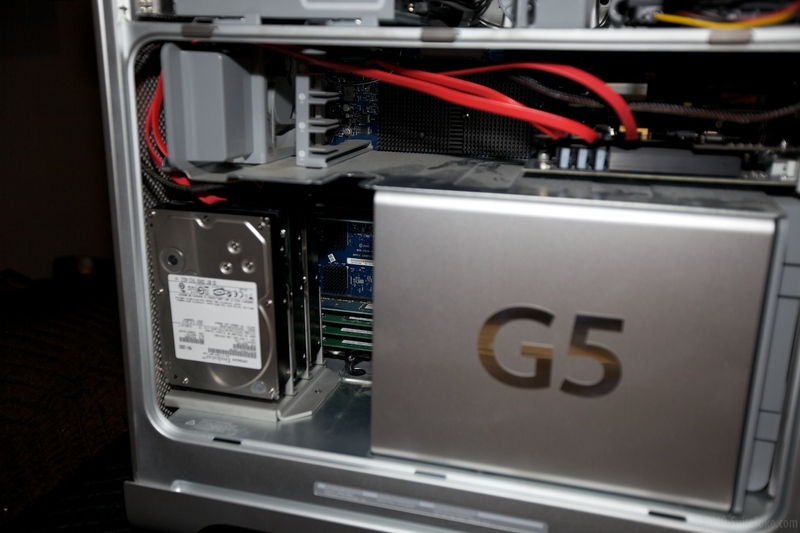 Before you get rid of that old G5 tower, ask yourself if there’s anyway it can make your life easier by automating something for you, acting as a server or just being a internal FTP or file server. There are many tasks that don’t really need Quad-Octo-Pecto-IntelAMD-SuperHyper-Threading chips, and will run just fine on a G5. The value that can be provided by keeping the machine can far exceed any small amount of cash you might get from selling it on eBay. Nice post! Definitely a lot more productive then collecting dust… Now did you do a software raid 0 or hardware raid 0? less battery life and twice the radiation. Is there a way of getting this creative samples software? Would be great to sort my library! it's perfected we may turn it into a product of its own down the road.